Five models Serial Device Servers with 1 port as RS232 or RS232/422/485 (three way) operation. The operation mode is easily configured by DIP switch or by software. Communication via WLAN is also supported. 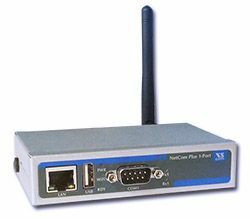 This is demonstrated with NetCom Plus 123 WLAN, essentially a NetCom Plus 113 equipped with the internal WLAN module. The NetCom+ Mini come in compact cases.